Awesome, much more comprehensive than I expected, thanks!! Getting from A to B. Friend from Poland with assist on those mods. Hello, i have just quick question. Will this bezel fit to Komandirskie watch? Yes, there is no reason it wouldn't, as Amphibia and Komandirskie cases have the same dimension bezels. Just be aware that large bezels may interfere with the crown. 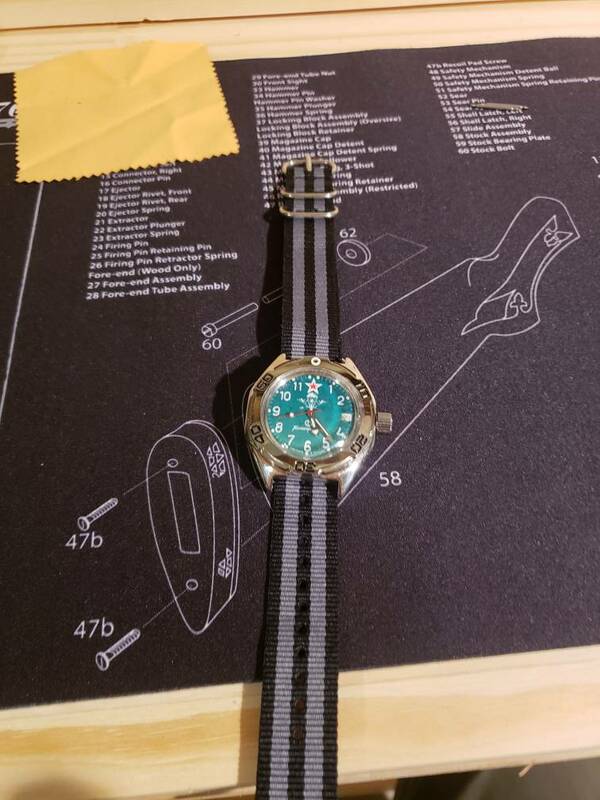 I had for a long time custom strap, that would fit some tool watch, but was too long for me to wear it comfortly. So, strap, prepared to be cut! Here is the surgery room (my kitchen room) and the surgery table. And final cut up to the right size for me. Slm643, Matt_Bored_O and Kamburov like this. Do you have sand paper or a file, something to maybe round off the corners a little otherwise very nice Indeed, and that is a really nice watch!, I would love to own! Those lugs are beautiful, do you know of any other watches like it that are available to purchase? You could PM me if you want! Last edited by Slm643; November 12th, 2018 at 21:26. This is a good way. What I do as well is pushing the mechanism with the finger from the other side towards the stem (first remove the rotor from that place, of course).